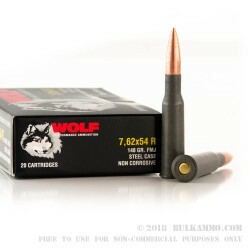 A very high-quality variant of one of the most proven battlefield rounds in history, this is the WOLF Ammo version of the tried and true Russian 7.62x54R ammunition that has been in service for more than 125 years. This version is the non-corrosive one, with an updated benefit to the old timey Military Surplus ammunition that so many Americans became familiar with during and after the cold War, while shooting Mosin Nagants and Kalashnikov style long range weapons from Eastern Bloc countries. This is a basic copy of the military surplus round with all the same performance markers and design characteristics, except of course with a non-corrosive primer and powder. The general performance and reliability of the steel case, Berdan Primer, potent, somewhat dirty powder and the FMJ in 148 grains makes this a legendary cartridge that has few rivals as far as reliability relative to cost is concerned. For that matter, the 7.62x54 is among the more reliable cartridges in history, just from a general perspective. 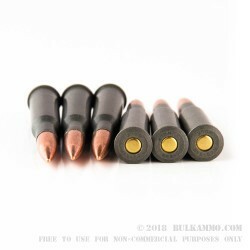 This round is suitable for use in any firearm made in the modern era that is chambered in 7.62x54R, and it will perform admirably. 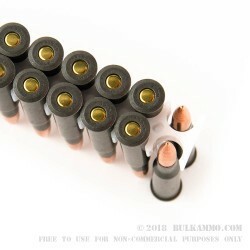 Q: Is bullet bi-metal magnetic? 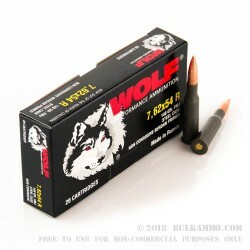 A: Hello Lee, The 7.62x54r Wolf ammunition is loaded with a bi-metal jacketed bullet and will not pass any magnet test.